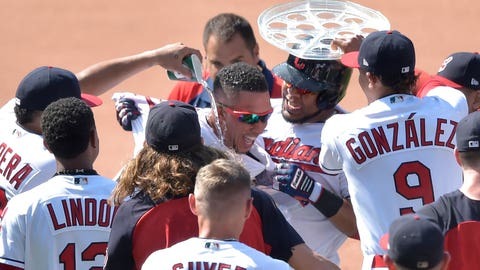 CLEVELAND (AP) — Michael Brantley‘s ninth-inning single gave the Cleveland Indians a 5-4 win over Minnesota on Thursday, their second straight walk-off victory against the Twins. Brantley grounded a 2-1 pitch off Addison Reed (1-6) past a diving Miguel Sano at first base to score Greg Allen, giving Cleveland another dramatic win. Francisco Lindor‘s three-run homer in the ninth inning Wednesday gave Cleveland a 5-2 victory. Brantley’s hit set off another celebration as he was mobbed by his teammates after rounding first base. Minnesota rallied from a 4-0 deficit against reigning AL Cy Young Award winner Corey Kluber. Jake Cave‘s fifth-inning sacrifice fly scored a run before Jorge Polanco hit first home run of the season — a three-run shot in the sixth — to tie the game. Kluber appeared to be closing in on his 15th win, which would have tied him for the AL lead with New York’s Luis Sevrino. But a couple of bad pitches and a misplay by right fielder Melky Cabrera prevented that. Bobby Wilson singled to lead off the inning. Eddie Rosario hit a towering fly to right with one out. Cabrera drifted to the wall and attempted a leaping catch, but the ball popped out his glove as he fell to the ground and Roasrio was credited with a single. Polanco followed with his home run to right on a 1-0 pitch. Kluber strick out the next two hitters and stranded a runner in the seventh, but was done for the day after 117 pitches. Lindor had three RBIs. His two-run double in the second put Cleveland ahead and he added an RBI double in the fourth. Yonder Alonso, who started the game in a 3-for-36 slump, hit a leadoff homer in the second. Indians: RHP Shane Bieber (6-2, 4.58 ERA) takes on White Sox LHP Carlos Rodon (3-3, 2.94 ERA) as Cleveland begins a six-game road trip.